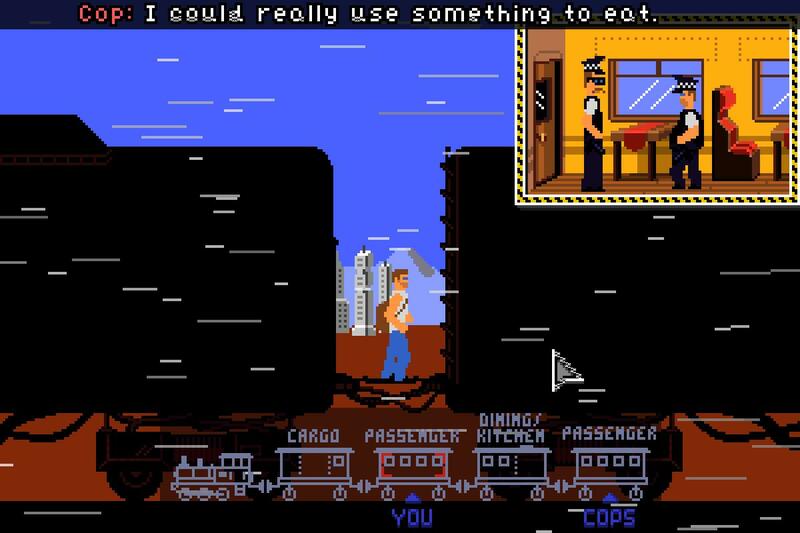 You play as an agent, briefed to defuse a bomb on a high-speed train. A DAW (Digital Warfare Assistant, ie. a hacker) is assigned to you and helps you through the game. Solid short game effort, with polised/interesting game mechanics. The 'exposition' feels a bit slow, but I don't know whether that's my paleo-machine or the game itself! Short, but clean and solid. What I hope to be able to do some day, with AGS. A little too much dialog for me, when dealing with the hacker, otherwise I really enjoyed all the elements. Lots of unique touches. Very clever short game with an unexpected ending (at least, I wasn't expecting it!). This game has by far the highest -gameplay elements- per -length- rate I ever encountered. What an impressive effort - to bring all of this together ! My favorites were the movement of the train and the kitchen smoke. I felt the need to know more of the main character's thoughts. Perhaps because of the emphasis on hacker's speech. This could also be one the few cases when a game features 2 main characters that are opposed. I remember the movie Heat as an example. For the theme of this game, perhaps you couldn't ask for a better main-menu music. However, I felt that the story could have been even more successful if the in-game music would have inspired more suspense. A personal choice, if you'll indulge me. My experience is limited, both as a game maker and as a player, but I think this game shouldn't be missed. If there would be an AGS Academy, this game would be required play. Very nice little game. I really liked how every puzzle is unique in one way or another, and how there are many non-standard systems and elements. Graphics are nice and pleasantly stylish too, with all the additional screens and GUIs making the game feel slightly bigger than it actually is, and establishing the cyberpunky aspects of the setting a bit more. A short game well worth playing. Really polished MAGS game with some well-implemented gameplay features and effects. I would love to see a 'deluxe' version of this.